Today, the georgaphy of the Schengen area counts 26 Member States. Of course, all members fully apply the provisions of the Schengen acquis. became members of the Schengen area in 2008. Finally, Liechtenstein also joined the Schengen area. 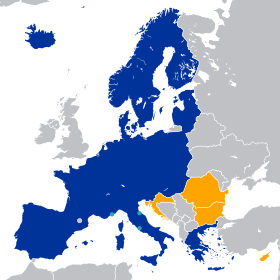 In fact, four non member Sates should join the Schengen area : Bulgaria, Croatia, Cyprus and Roumania. Also, please note that some territories remain out of the Schengen area, such as french territories : Guyana, Guadeloupe, Martinique, Réunion, Mayotte, Saint-Barthélemy and Saint-Martin. There are Member States of the European Union who are still outside the Schengen Area. These are the United Kingdom and Ireland, which chose to maintain border inspections for traffic to and from other Member States of the European Union.